Fallkniven's F1 leather sheath. A full grain leather, black sheath, with snap down cover for the knife. 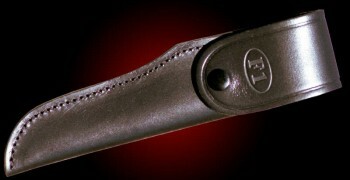 Leather starp allows for belt mounting, embossed with the F1 mark. Use the form below to order the F1 leather sheath only . Feel free to contact us if you have any questions about the F1 leather sheath only .